There are a lot of people who have a cat as a pet because they are adorable and they can also be your best friend. In the past rich Thai people liked to have cats to bring them luck. Not every type of cat gives good luck …Today I will introduce you to 5 different breeds of Thai cat offering different types of good luck. วิเชียรมาศ / wí-chian-maât means like a diamond of moon and well known for foreigners as Siamese cat. In the past Thai people liked to have it in the house as they thought the cat would bring them luck – the lucky cat. Wí-chian-maât has light cream colour fur and dark brown spots on its body – a general good luck cat. ขาวมณี / Kaǎw-má-nii or ขาวปลอด / kaǎw-plͻͻt the outstanding characteristic of this cat are its white short hair, long body and legs, heart-shaped face, flat big forehead, upright ears short nose and oval-shaped eyes, The colour of its eyes may be yellow, blue or both. If the cat has kittens with 2 different eye colours it will have one eye that will either be blind or have limited vision. Most blue eyed cats have a problem with hearing or may well be deaf and for most yellow-eyed cats may have a problem with their fur follicles. This said, Thai people in the past believed that this was god’s cat and if you had it in your house, it would give the owner’s success and bring luck – a general good luck cat. ศุภลักษณ์ / sùp-pá-rák or ทองแดง / tͻͻng-dεεng has dark copper brown hair on ears and face especially. 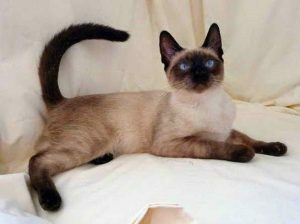 Thai people believed that if you own this Thai cat it will support your rank and progress well – a career good luck cat. This breed of cat originates at Nakhon Ratchasima province. It has lots of names such as แมวโคราช / mεεw kooraât , แมวสีสวาด / mεεw sriǐsàwaàt, แมวมาเลศ / mεεw maalêet, แมวดอกเลา / mεεw dͻͻklao and แมวสีเทา / mεεw siǐta. This Thai cat is always used in Rain ceremonies because its hair color is grey likes clouds. Thai people in the past call it มาเลศ / malêet and believe it would bring fortune and it’s auspicious for the owner – a good luck weather cat. Some people call it ดำมงคล / dam mong kon because its hair color is pure black and also very soft and smooth. The Goonja Thai cat’s eyes are a green-yellow color like the luffa’s flower color. Its claws are similar to a lion’s but a lot smaller! Thai people in the past believed that if taken care of well it will bring lots of luck – a super lucky cat.